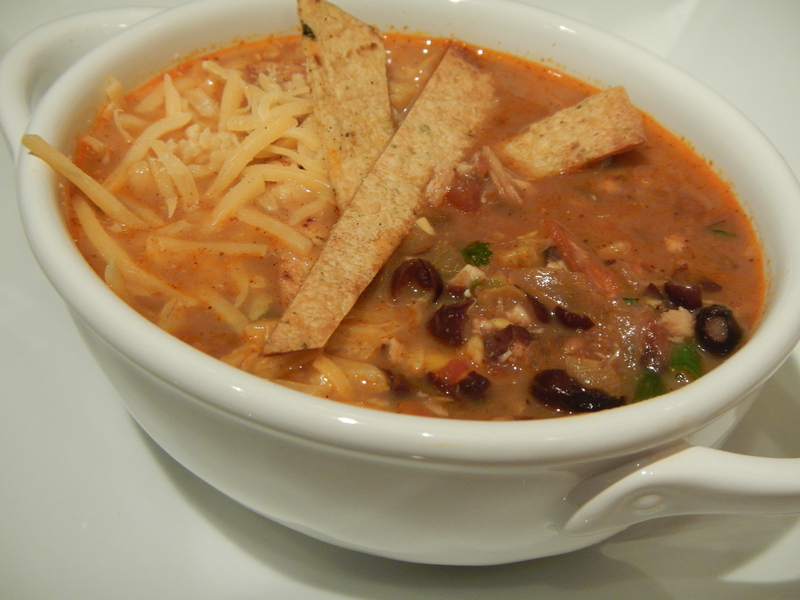 Chicken Tortilla Soup | This Girl’s Gotta Eat! Boil chicken in a pot of water until fork tender. Remove to a cutting board and let rest a few minutes before shredding or cutting into cubes. Set aside until ready to add to the soup. Spray tortilla strips with a little non-stick spray and bake on a cooking sheet for a few minutes until crisp. Remove from oven and set aside until ready to serve. In another large pot, heat oil (use whatever you have) and saute onion and garlic for a few minutes. Add chipotles and break up into small pieces with a wooden spoon, let cook for a minute or so to melt into the onion and garlic. Add the chili powder, season with salt to taste and cook another minute. Add the broth and tomatoes, bring to a boil and reduce to simmer. Cook for 15 minutes. Add the corn and black beans, continue to simmer, stirring occasionally for 5 minutes. Using an immersion blender, puree some of the soup slightly – just a few clicks of the hand blender. This will help thicken the soup a little. Then, add chicken and warm through, simmering another 5-10 minutes. While the soup cooks, mix yogurt with the zest of 1 lime and season with salt to taste. Before serving, remove soup from heat and add the juice of the lime you zested. Taste and season with salt if needed. Stir in the yogurt and mix well to combine and yogurt melts into the soup. Divide among bowls and garnish with cilantro, green onions, cheese and tortilla strips.